Here's an easy 2 tier skirt to make your little girl. No patterns just a few measurements. You need a waist measurement and how long you want your skirt. I typically use an existing skirt in the closet that fits to judge how long to make the girl's skirts. For the 2 tier skirt I usually like it a few inches below the knee, but I am guilty of often making them big so they last 2 years. The above skirt I just finished for K who is 5.5 years and wears a 6. Here is one I've made for the 2 year old. Maressa size 2T~ top tier 7" x 42"
If the skirt you want to make is somewhere in between, add or subtract inches from the second tier cuts. The top tier includes 2" for the elastic casing. 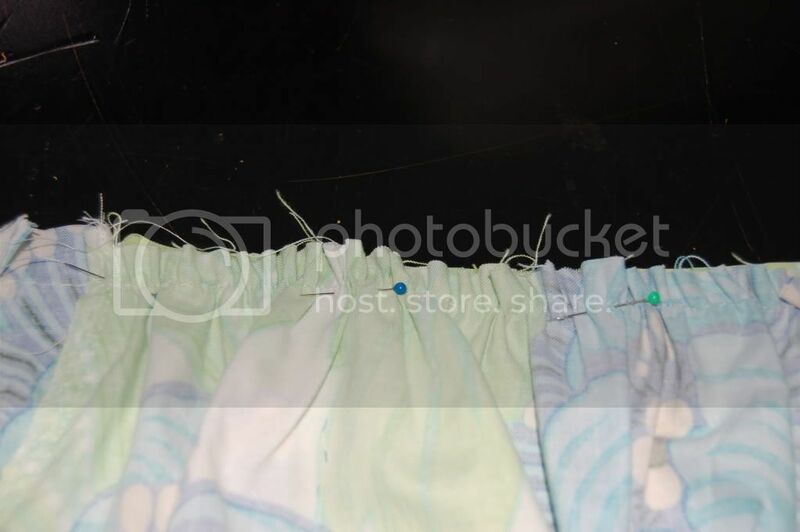 When you've got your strips cut, sew the top tier piece on the sides (you can use french seam here if you don't have a serger for a neat look). Now with right sides facing sew the 2 second tier strips together. You should now have 2 tubes, one about twice as wide as the other. Now that your side seams are done and finished how you want, you want to take the really long tube (the second tier) and hem the bottom. You can hem it plain, or do a rick rack hem, or use bias tape (like I am above) or contrast fabric hem. The prepackaged bias goes on much like the contrast fabric. The main difference is that it has all these neat little folds already. If you look carefully at your prepackaged bias tape, you'll notice one side is folded wider than the other just very slightly. You'll start with that side on the wrong side of your hem. Open the tape and pin it edge to edge. 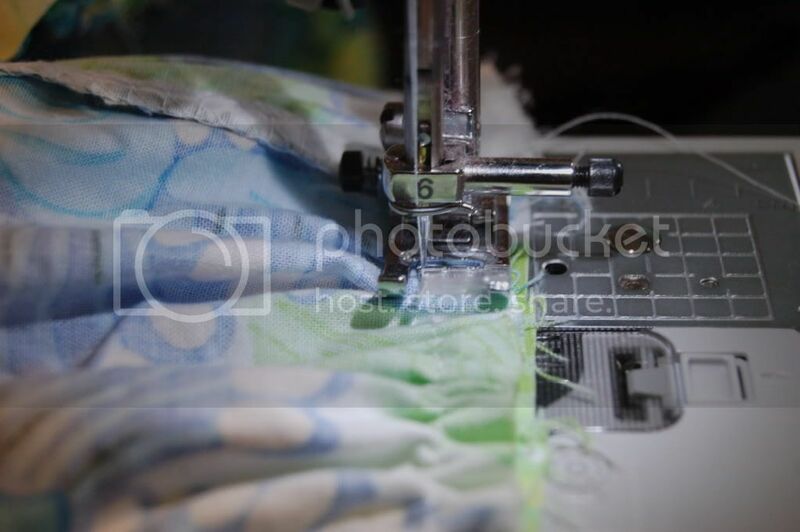 Sew down in fold. 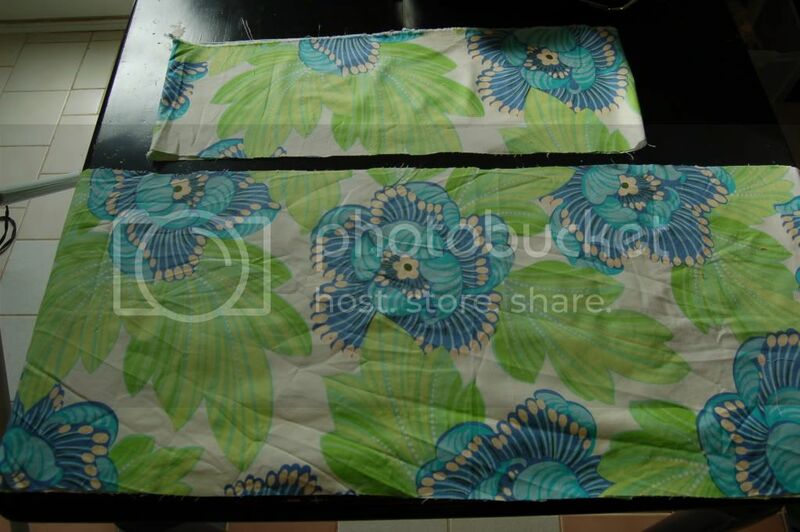 Now fold it over to the front side and topstitch it down. Now that your hem is done, you'll need to gather the top of the second tier. This is how I prefer to do it (not necessarily the ONLY way). I gather from seam to seam making it easier to get even gathers along the skirt. 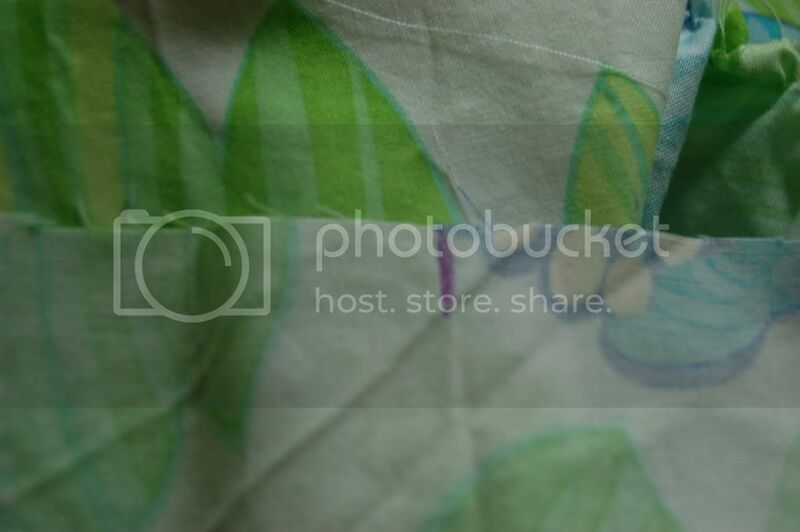 So you'll start at one seam, backstitch, then turn your stitch dial up to the highest number. Stitch across til you get to the other seam. Now when you pull your skirt away from the machine to cut the threads, cut the top thread short, but pull the bottom/bobbin thread long. This will be your thread you will pull to gather. Now start again at the seam you stopped at and repeat last step to other seam. Now pull your bobbin threads carefully and gather both sides. Now with the way I make these skirts, I generally only have one seam for the top tier (you can always cut it in half and sew both sides if you like). So to help me gather each side neatly and evenly to the top tier, I mark the opposite side of the seam to show me where the 'other' seam would have been. 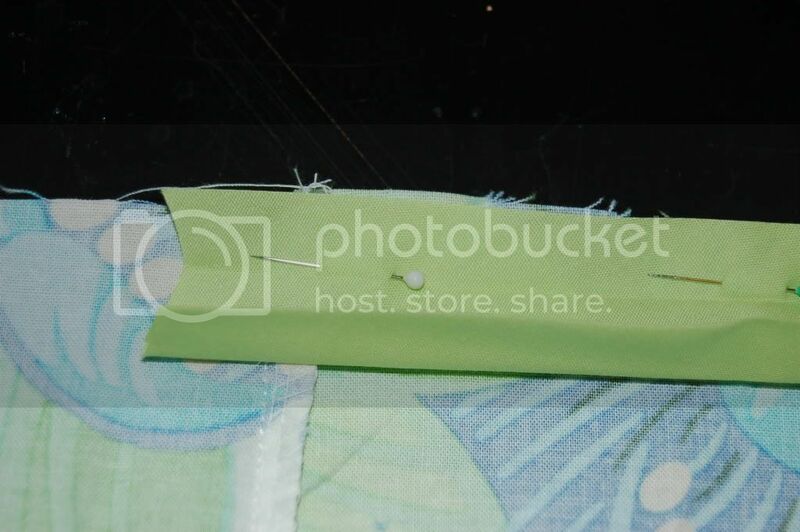 I gather and pin right sides facing and match seam to seam and seam to mark. Now sew carefully across gathers to attach the tiers. 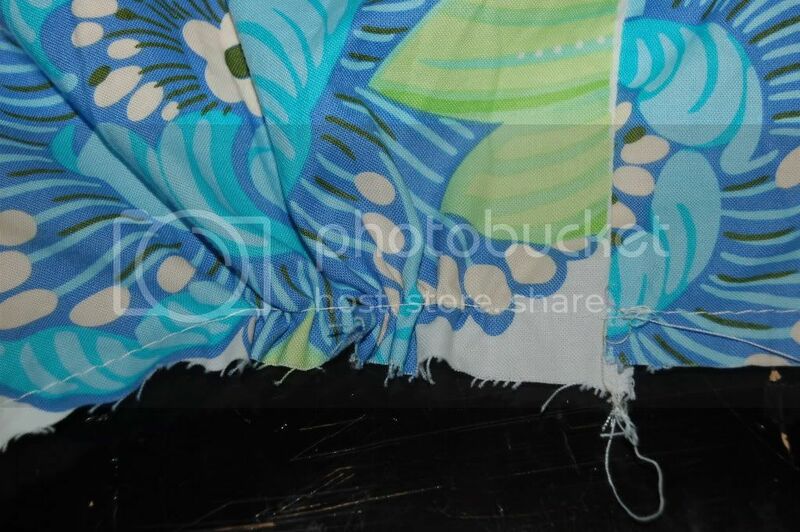 Be careful that the fabric on the bottom is feeding flat as it easily catches under and creases. Here is where I serge that seam. 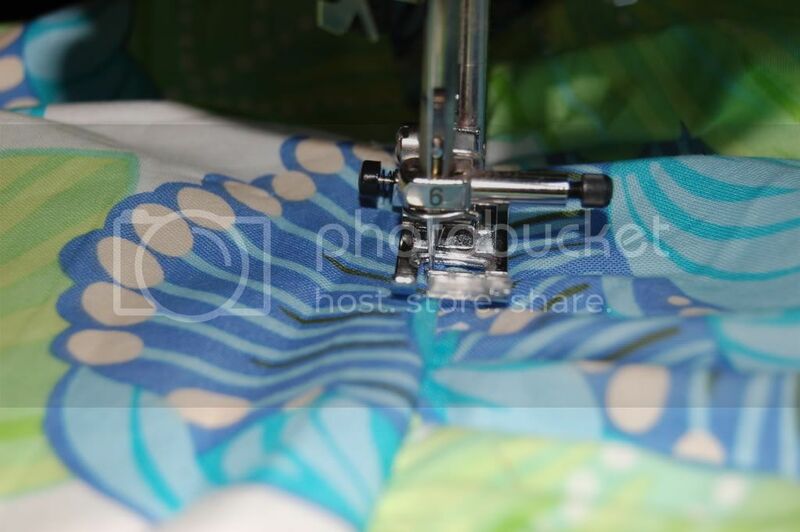 If you don't have a serger, then use a zig zag stitch or over casting stitch on your machine to cut down on fraying. This part is a totally preference thing. I like my tiers to be topstitched down. 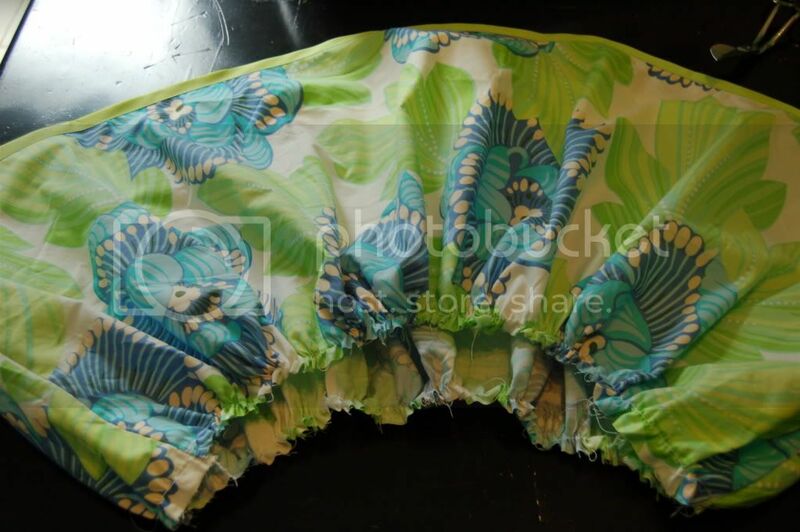 So if you like, on the right side of your skirt topstitch the top tier right above the gather. Now you are ready to put in your elastic casing. Take the top of your skirt and fold down about 1 1/2", tucking under the edge, pin and sew leaving a spot to pull the elastic through. Measure your elastic to the waist of the little girl. Cut exactly the same size, not bigger. For example, K is 21" and I cut that length of elastic (and I use 3/4 elastic). This is because you want the finished waist to be a tad smaller than the waist or it will never stay up. Once you've pulled the elastic through (I use a safety pin attached to pull it through), then sew the 2 ends of the elastic together. Now carefully stretch the open spot area to sew that down. Now you are done with the skirt! 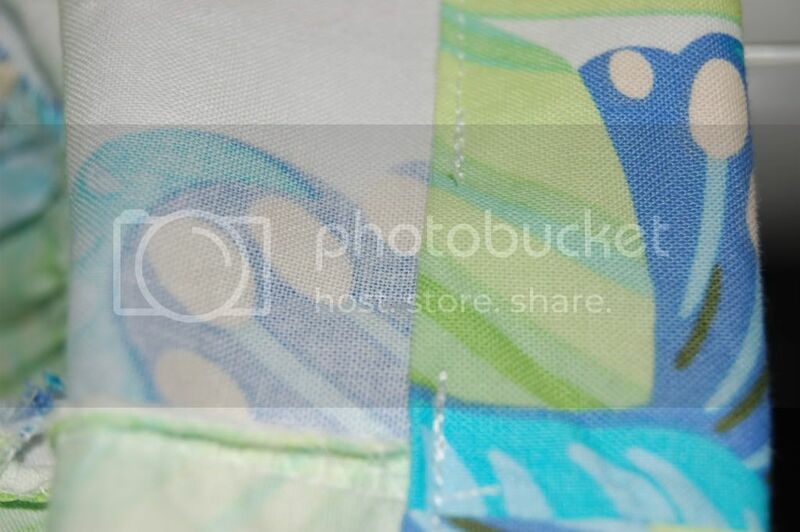 I have labels for my clothes, but if you don't and want to mark the front, sew a button or bow to the front center, or stitch an initial on the inside center back where a label would go with embroidery floss. Ta da! Now go applique some cute shirts to go with it! And now that I see this skirt all done, I'm thinking I need to make one momma size!! It is beautiful Deanna! You are so talented! Oh it's great Deanna! Simple and so pretty for spring! I'll be linking. I don't see anywhere where I can e-mail you a question, so I thought I'd ask it here. I was wondering if you would do a post/tutorial on patching boys' jeans with a cute themed patch (trucks, trains, etc.) My 5 year-old is wearing holes in every single pair of his jeans right now. I'd love to patch them, but don't want to just do the old style square jeans patch on the front. I have no idea how to patch and do something cute! Could you help?! i love this! 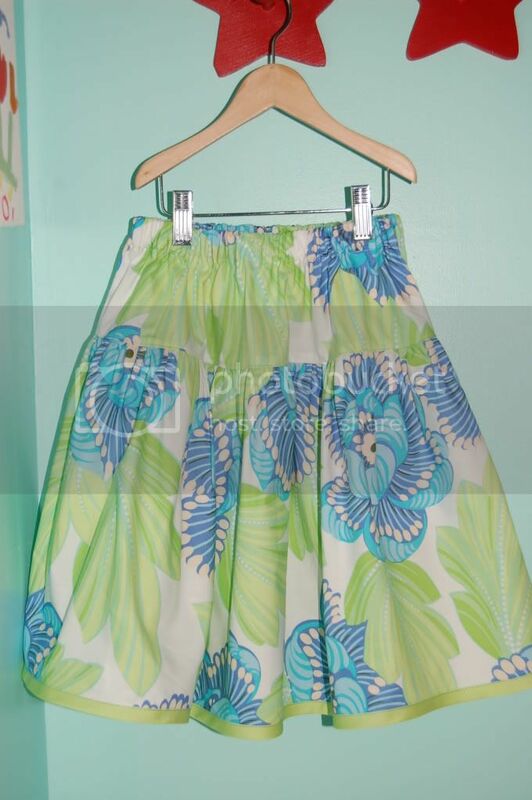 i even dreamt about this skirt last night. i've done a skirt that is just one single width of fabric, but i love the added tier with 2 strips. my daughter will love it! thanks for the great tutorial! I'm so glad I saw this on One Pretty Thing! I've been wanting to do something exactly like this, but I wasn't sure how to do the gathers. Awesome! This is great. Thank you so much for the detailed directions and photos. I think I could actually do this for my girls! Sounds great! I'll be watching for the patching ideas!! I would love to make one of these in my size but I'm not sure how. thank you so much for postig this, it's a really cute skirt! 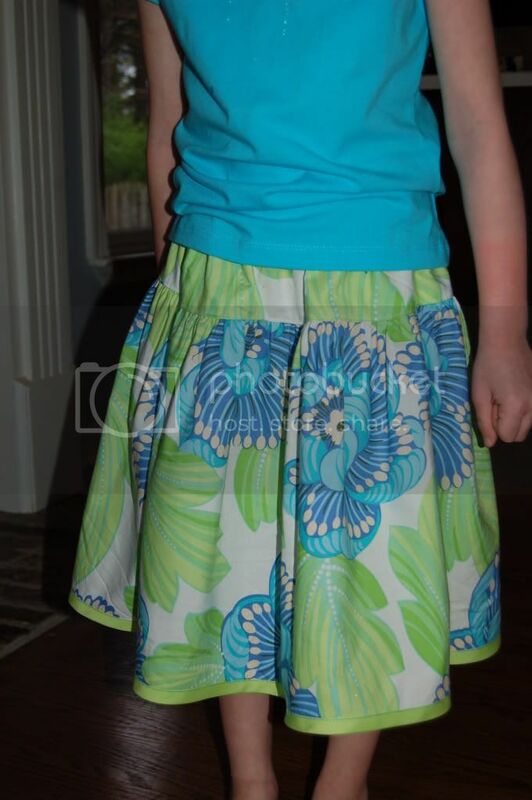 i have been wanting to sew my daughter a skirt like this and I am excited to use this tutorial! I finally got around to making one of these with your rick ram hem tutorial and a matching kitty applique shirt. Thanks so much for the wonderful tutorials. My niece loved it! It was extremely interesting for me to read that blog. Thanks for it. I like such themes and anything connected to them. I would like to read more soon. 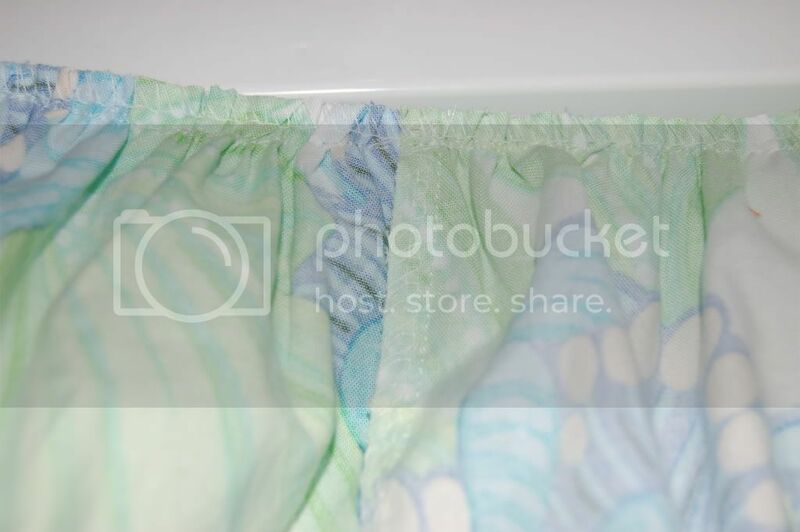 I am a novice sewer, but I managed to whip out 2 of these for my girls. 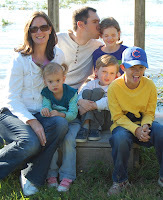 They are so cute...and my girls can't stop twirling! Thank you for posting this! Thanks for the tutorial for this lovely skirt, I just made one for my daughter who loves skirts especially Twirly ones! I love this! I pinned it to my Sewing board! Thanks for sharing!